It really is non-stop excitement at Galway’s Quay Dental at the moment. In the midst of receiving awards for the excellence of their work, the team are enjoying their expanded premises following a major refurbishment at the turn of the year. The expansion copperfastens the remarkable reputation of a practice that is making waves because they offer innovative, patient-friendly services like sedation and a modern approach to orthodontistry that has seen them become recognised nationally for the excellence of their service. 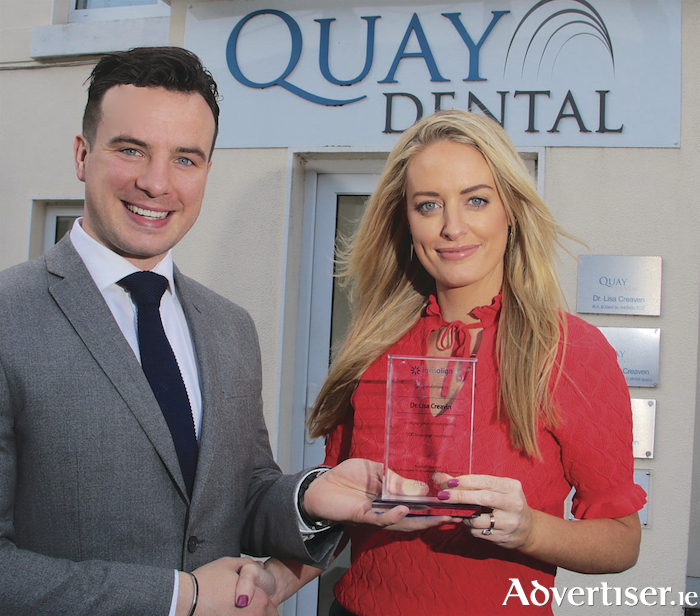 The state of the art premises ensures that patients can receive their treatment in the most comfortable of surroundings, and the development comes as owner Lisa Creaven recently received an award for 1,000 successful treatments using Invisalign. “Asolutely this is a fantastic achievement,” said Ms Fusco. “It is a credit to the expertise and ongoing training as part of the Clearbraces group; an expertise that gives our patients confidence in us to have Invisalign treatment. The provision of a sedation clinic at Quay Dental has changed the image of a trip to the dentist for many normally nervous patients. “Our sedation clinic is extremely popular, and we treat nervous patients from all over the country. Dental phobia is hugely common, so this is a great facility to be able to offer. We perform IV sedation which is safe and appeals to anxious patients. We are currently offering complimentary sedation examinations and welcome anyone to book in for an assessment who feels they would like to have dental treatment under sedation,” said Ms Fusco. “2018 is an exciting time for the practice. We have welcomed Dr Alma Creaven, sister to Dr Lisa and Vanessa Creaven and also a full time orthodontist Dr Badov. We are continually growing and investing in the latest technologies such as Invisalign scanner which takes a 3D scan of your teeth, thus creating a virtual model. We can turn your scanned smile into your dream smile,” she concluded. Could Galway city become Ireland’s first urban national park? Page generated in 0.1458 seconds.